We had seen Iguazu Falls from above, from below, and from straight on. Just when you think the falls could not get any better, you realize you can take an Iguazu boat tour and experience the falls from underneath! 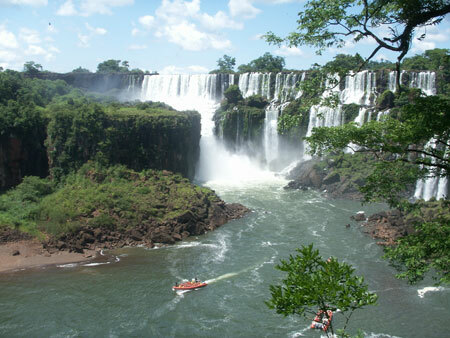 Considering how hot and incredible Iguazu National Park is, this is an expensive excursion well worth taking. 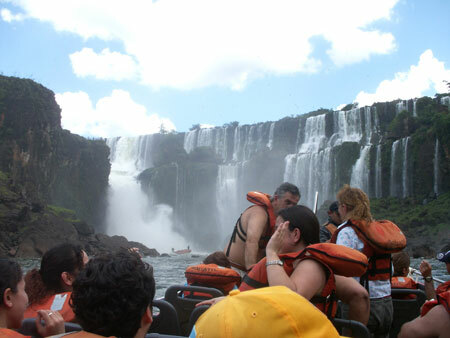 The Iguazu boat tour costs $45 pesos and lasts about 10 minutes! It is a little ironic that anyone would pay that much. If you want a longer excursion, you can take the 4×4 vehicle through the jungle area and then hop on a boat ride that is a little longer but does the same thing. This excursion costs $90 pesos. My friends did this excursion and said it was not worth the money. They figured they should have just taken the iguazu boat tour, as they did not see any animals on the 4×4 drive. Due to their recommendation, we just did the boat tour. Therefore, across from La Isla San Martín, we buckled our life jackets and removed our shoes and valuables. Luckily, the park provides a bag to protect your things from the water. We all climbed into the boat, and it quickly took off! The boat came to a stop about five seconds later because the driver wanted to allow us all the chance to take pictures from within the boat. This is a cool photo opportunity. You can either take the photo yourself, or there is photographer on the boat who will take a picture for you. He also videotapes the boat ride. Both the photos and the videos are available for purchase. When the cameras finally stopped clicking and were safely put away in the bags, the ride really began! We drove up one canal at an exciting speed. The driver then took us under a waterfall again and again in order to make sure we were all thoroughly soaked! We then sped off for the other canal. This side had much better waterfalls. 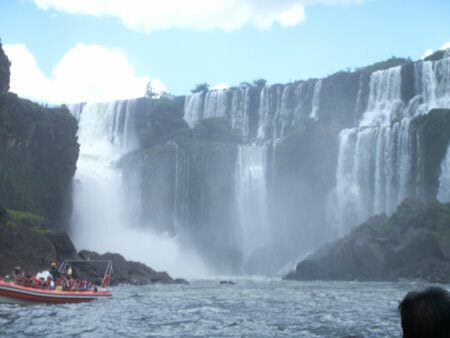 I am sure all of the passengers’ eyes widened as we drove closer to the main huge waterfall of Iguazu. I have no doubts we were all wondering the same thing, “Is he really going to drive the boat near that fall?” You better believe it! We entered the vicinity of the fall, and the water came down so hard; I could not even keep my eyes open! It was quite a thrill and a once in a lifetime experience! Therefore, even though it cost us $45 pesos (a mere $14 U.S. dollars) for a 10-12 minute experience, I would say that the Iguazu boat tour was worth it. How often do you get to go under the downpour of a waterfall….especially some of the most incredible waterfalls on this planet? I never have, and I was glad we did it…not to mention it really cooled me down. My clothes were wet for the rest of the afternoon, and that is a nice feeling in a hot and humid area! Actually think that the longer trip at Pesos $100 (Nov 2007) is worth it. Not only do you get more time under the falls but you also get a great ride dow/up the river to where the truck is. Didn’t see any animals on the truck ride but did see lots of birds, butterflies and learned quite some facts about te vegetation, trees and forests. Thanks for the insight, C.B! I’m the type who loves getting more facts and trivia on the places I visit, so this is good to know. wow sounds so much fun hope i can visit!!!!!!! All i can sayis WOW!!!!!!!! This page rendered in 0.409 seconds.